When not gorging on takeaways recently, I've found myself down my local pub for a few gin and tonics with friends and the inevitable burger. 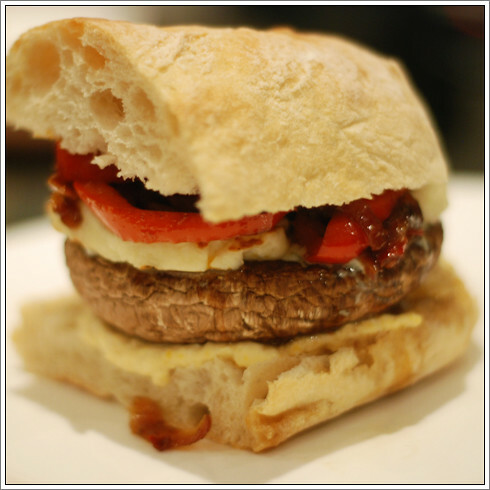 I always have the same one - a divine portobello mushroom and halloumi burger served in a ciabatta roll. So instead of going out and buying more burgers down the pub, I thought I'd have a go at my own version. As a small bonus the ingredients for four people cost the same as a burger for one. Bargain! Start with the relish: peel the onion, slice it in half and then thinly slice. Fry over a low heat for a couple of minutes until just translucent. While the onion starts to fry, thinly slice the red pepper, discarding the seeds. Add to the onions with the cumin and coriander and once the onion starts to brown, cover the frying pan to ensure the moisture is kept in. Cook for about 30 minutes, stirring occasionally until the peppers are soft. Then, add the sugar and harissa and stir until the sugar has melted. If necessary, add a couple of tablespoons of water to the pan to loosen the harissa, but make sure the water has evaporated before you set aside. Once you've made the relish, move on to the rest of the burger. To prepare the mushrooms, crush the garlic cloves over the mushrooms, making sure the garlic is evenly distributed. Season with salt and pepper then drizzle with oil. Place under a hot grill for 10-15 minutes, until cooked. While the mushrooms are cooking, lightly toast the ciabattas and smother the bottom layer with a tablespoon of hummous per roll. Just before the mushrooms are ready, slice the halloumi and griddle until cooked - I find about 30 seconds to a minute each side tends to be enough. Place the mushrooms on the hummous, then arrange the halloumi slices on top of the mushrooms. Add a large spoonful of the onion and pepper relish, and gobble down greedily. Perfect summertime veggie burgers!